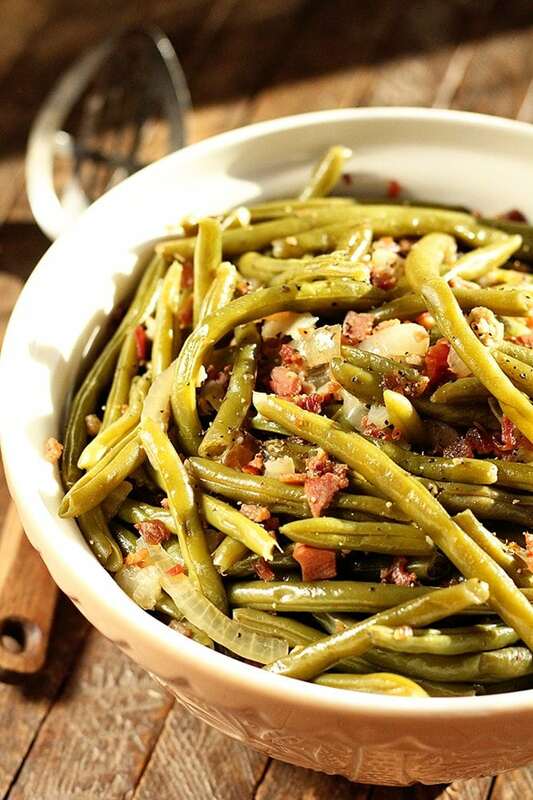 Growing up, I only knew green beans as the super tender Southern style recipe with bacon and onions. So the first time I had green beans prepared lightly steamed, I thought someone had really screwed up! They were crunchy! Admittedly, I’ve grown to love them both ways. French style haricot verts make frequent appearances on our weeknight table because I can steam them in the microwave and they’re a light, delicious, easy side. But that doesn’t mean I don’t love the green beans from my childhood. Lightly spray the crock of your slow cooker with nonstick cooking spray. Add the beans, chicken broth, onion, salt, pepper, and about 1/2 of the bacon. Cover and cook on high for 4 to 6 hours or low to 6 to 8 - or until the beans are tender to your liking. Stir the beans a couple times during cooking. Serve topped with the remaining bacon pieces. Must. Try. This! 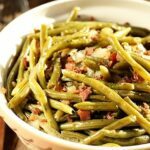 Hubby and I love green beans with bacon and onions–just never made them in the crockpot before. Thank you! 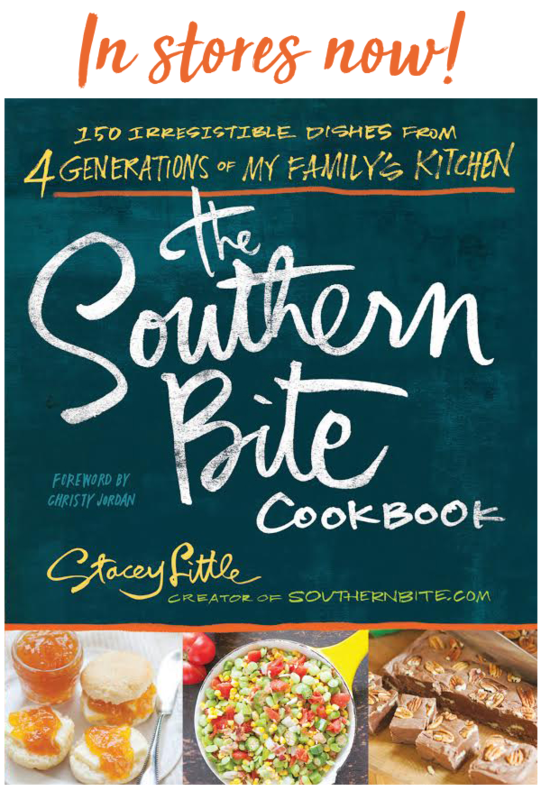 Could I use home canned green beans? I did about 30 qts this summer and normally just reheat them briefly on the stove top. I wonder if they’d be too mushed reheating in the slow cooker since they’ve already been processed. What do you think? You could, I’d just cut the cook time was back to avoid them being overcooked. No. Canned green beans are precooked and this would torture both you and that poor green bean. Just mix and warm up. 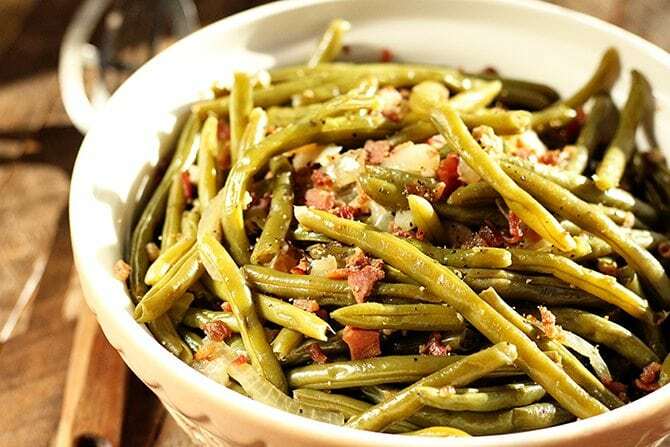 Growing up north with a German Aunt this is the way we always ate green beans except for the splash of vinegar prior to serving. Now that balsamic is so popular I always have different flavors so I try various ones instead of just apple cider vinegar. All time favorite is an orange balsamic. Try it and taste the wonderful difference this makes. That sounds great! Thanks for sharing, Margi! 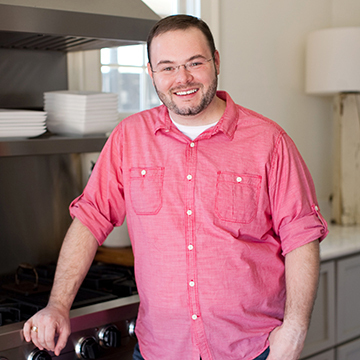 We are hosting our first Thanksgiving and I’m excited to try your recipe! If I wanted to make 4 lbs. of green beans, how much additional time would you recommend cooking them for? Thank you! Hi Bethany! The cook time should be about the same. I don’t see any need for additional time. Y’all enjoy! Can I use canned green beans? You can, but the cook time won’t be as long. Maybe just an hour or two. Do the can beans need to be drained first? If I wanted to make 4lbs green beans should I use the portions for every other ingredient also? I would double everything exactly. Do you cook the bacon before adding to the crockpot? The bacon should be precooked bacon. I would, but 1 can would probably be enough. This recipe was excellent. I used 2 tsp of salt and 2 pounds of frozen green beans that I thawed by rinsing and draining. Thank you! This saved me so much effort and stove top space. I made this with 1 variation. I used about 1/4 cup bacon and 2-3 Tbsp of butter. Still had the smokey bacon flavor and luxurious mouthfeel with the butter. None left and we started calling butter “Vitamin B”! Lol great recipe! So glad they turned out great for you! I’ve cooked my slow beans with ham hocks, for six to eight hrs. Just in case a cook did not know that the real bacon pieces in the recipe, are pre cooked , I think you need to say cook them until done before adding to beans, unless you bought precooked.. I think it would be easy for a novice cook, or one living in a different country to think real bacon pieces were just packages of raw bacon. Otherwise very nice recipe.